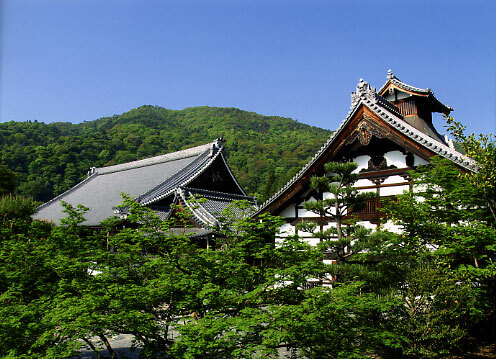 Tenryu-ji, located in the Sagano district in the western outskirts of Kyoto, is the head temple of the Tenryu-ji branch of Rinzai Zen Buddhism. It was established in 1339 by the shogun Ashikaga Takauji 足利尊氏 (1305–1358) in memory of Emperor Go-Daigo 後醍醐 (1288–1339), who died in the mountains of Yoshino following the civil war that brought the Ashikaga family to power. The eminent Zen master Muso Soseki 夢窓疎石 (1275–1351) was appointed the temple’s founding abbot. The site of Tenryu-ji had earlier been occupied by the temple Danrin-ji 檀林寺, established in the ninth century and historically significant as the first Zen temple in Japan. In the thirteenth century Emperor Kameyama 龜山 (1249–1305) built a villa on the property, and it was here that Go-Daigo, his grandson, was raised and educated. In order to finance the temple’s construction, Muso Soseki commissioned a vessel, known as the “Tenryu-ji Ship,” on a trade mission to Yuan-dynasty China. By 1345 the major buildings of the temple were complete, and the temple was later designated number one of the Kyoto Five Mountain monasteries. 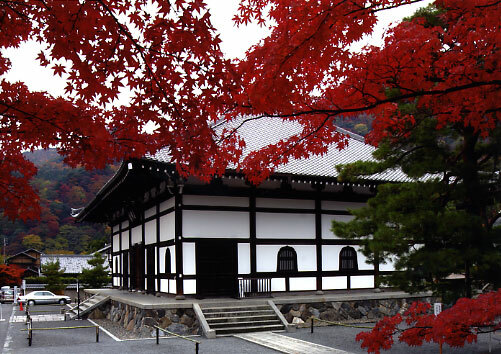 Its founding Tenryu-ji has been ravaged by fires a total of eight times, first in 1358, soon after its completion. Most of the present buildings thus date only from the Meiji period (1868–1912). However, the landscape garden behind the Hojo (Main Hall), designed by Muso Soseki, retains the same form as when it was made in the fourteenth century. Known as the Sogenchi 曹源池 Garden, it was designated by the United Nations as a World Heritage site in 1994. The Sogenchi Garden, located behind Tenryu-ji, is one of the oldest landscape gardens in Japan, retaining the same form as when it was designed in the fourteenth century by Muso Soseki. Its distinctive beauty combines the traditional Japanese refinement of imperial Yamato painting with the dynamic Zen culture of Song and Yuan China. 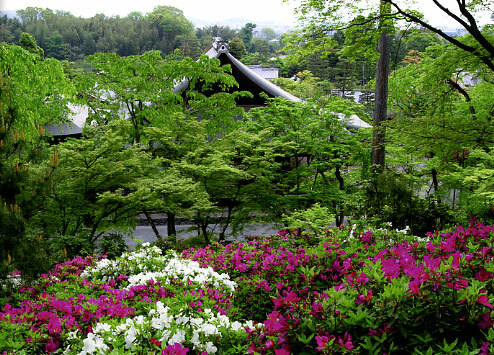 The surrounding heights of Arashiyama and Kameyama are incorporated in the garden as part of its shakkei (“borrowed scenery”) design. 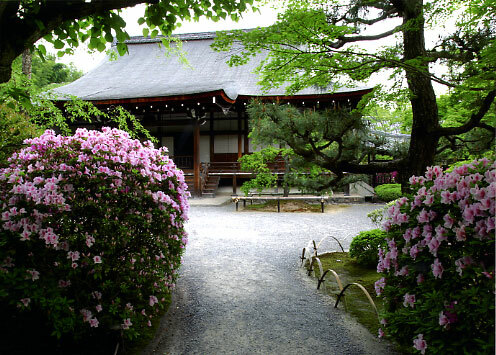 It is also the oldest surviving kaiyu-shiki strolling garden in Japan. 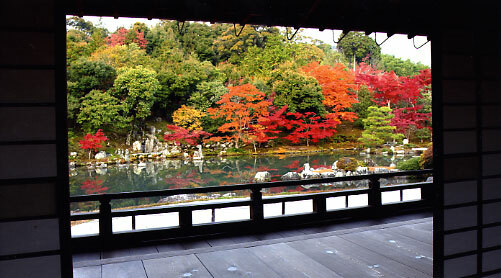 The Sogenchi Garden was the first Special Historical Scenic Area named by the Japanese government. The front section of the garden features a peninsula and an island, with the white of the sand emphasizing the green of the pines in a design inspired by Yamato art. In the back of the garden are dynamic arrangements of large stones against the hillside, representing the scenery of a mountain ravine. The central feature is the “Ryumon-no-taki,” a two-tiered composition of standing boulders representing a waterfall, bringing to mind the ancient Chinese legend of a cascade where carp, after successfully jumping the falls, transform into dragons. Directly in front of the stone waterfall is a bridge made of long, flat rocks, as well as a small island-like arrangement of three tall stones representing the Buddha and his two chief disciples. The surrounding waters of the pond reflect the trees on the slopes of Kameyama and Arashiyama mountains, displaying a distinct beauty throughout the four seasons of the year. The Tahoden, reconstructed in 1921, displays a large seated image of Emperor Go-Daigo, whose Kameyama Palace was reconstructed in the mid-fourteenth century to make Tenryu-ji. The former Meditation Hall, called the Senbutsujo, was moved to the present location to serve as the Dharma Hall (Hatto) following the great fire of 1864. The three images represent Shakyamuni Buddha in the center, with Manjusri Bodhisattva and Samantabhadra Bodhisattva on the sides. 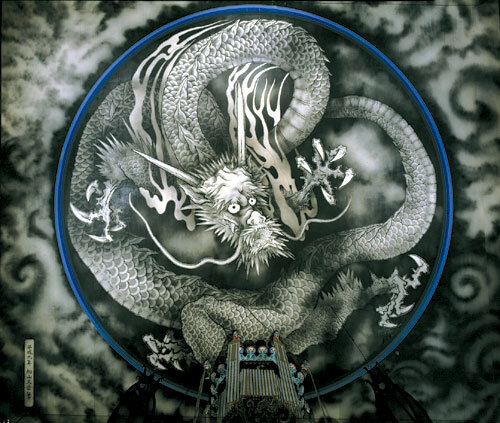 The Cloud Dragon painting on the ceiling is a modern rendition by the noted painter Kayama Matazo. This representation of Shakyamuni Buddha’s passing into Nirvana is an embroidered silk hanging scroll measuring 3.5 meters square. Together with its mounting, the entire piece is 4.35 meters tall and 3.37 wide. It is one of the largest embroidered Nirvana pictures in Japan. 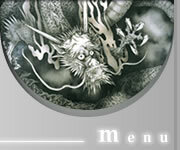 It is believed to have been made in the late seventeenth century. It shows the finest craftsmanship, with twenty-two different colors of thread employed with exquisite precision to create a scene of great artistic beauty. The topknot on Shakyamuni’s head is embroidered not with threads, but with human hairs thought to have been donated by believers as an expression of devotion to the Buddha. 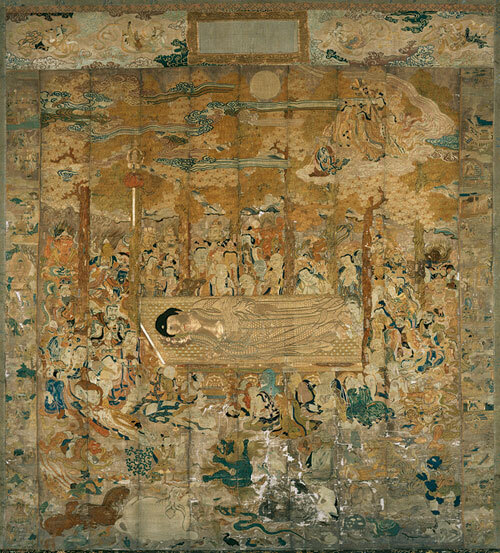 In the top center of the picture is a frame containing the words “Nehan-gyo” (Nirvana Sutra). On the right and left sides are pictorial representations of the life of the Buddha. This Nehanzu is highly unusual in that it includes a cat among the mourning animals (left side), a feature it shares with Tofuku-ji’s enormous Nehanzu by the artist Cho Densu. The “Shishu Hasso Daihannyazu” is displayed every year on March 15, the date of the Nehan-e ceremony.